Well where else could find such a fakery other than China? The country who reverse engineers original products to produce fakes but it’s not limited to vehicles. Everything is fake. Even energy drinks. This is Land Rover energy drink, not official but some company who has copied the bottle design of a Brazillian energy drink Recca, and the name of the famous British 4×4 which even sells in China. The brand is called ‘Land Rover’ and its logo is Jaguar-like. The characters write ‘Lu Hu’, which means ‘Road Tiger’, which is the genuine Chinese name for Land Rover. 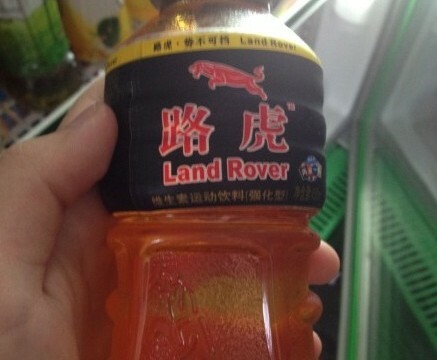 This bottle of Land Rover was found by a reader of the Car News China in the great city of Guangzhou in Guangdong Province.